Thanks to Bush, now we know. He’s like a walking object lesson in the importance of voter turnout. I’m Australian, but one of the greatest things I’ve ever seen was a rally outside City Hall in New York in 1999 to protest the police shooting of Amandou Diallo. Thousands of people voicing their grief and outrage… all quietly and competently supervised by the target of their protest, the NYPD. In plenty of countries, the cops would have been beating the crap out of those protestors. In the others, the protesters would have been throwing rocks at the cops and setting their cruisers on fire. But not in the United States. It was, to me, not just impressive but almost magical. Then there was September 11. In the aftermath, there was a global outpouring of grief and sympathy for Americans—and more than that, of allegiance. If you lived in the US, you might not have noticed this. Your attention was, of course, focused inward. But it was there, and it was extraordinary. It was overwhelming. What I heard over and over was, “Today, we are all Americans.” Throughout the world, people wanted to stand by the US. I wonder now what might have happened if the war on terrorism had chiefly been a diplomatic one. If the Bush administration had defined what terrorism was and called the world together to expunge it—not just in one country or two, but globally, and no matter in which cause it was employed. In 2001, with that incredible worldwide feeling of unity… maybe it was possible to take that act of great evil and extract from it a great good. But it’s not possible now. That global unity is gone, and in its place is cynicism and mistrust. It happened because George W. Bush told the world it was irrelevant. As the war on terrorism morphed into an invasion of Iraq, Bush and his administration said it again and again: “You either agree with us or you are meaningless.” Maybe it was ignorance of the importance of international diplomacy. Maybe it was arrogance. Maybe it was even realistic. But one thing’s for sure: the world had offered its hand in solidarity and it didn’t like having it slapped away. Opinion of the US has fallen so low that America is now widely viewed as the greatest threat to world peace—not just by people in “Axis of Evil” countries, or Muslim countries, but by majority populations in Western countries, like Australia, that are staunch US allies and have troops in Iraq right now. That sounds absurd if you live in the States, I know. But to understand it, imagine you don’t. Imagine it’s China that has more military power than the next 20 countries plus yours combined; China’s new government that rapidly cancels international treaties on everything from anti-missile proliferation to global warming; that announces it has no use nor care for world opinion; that conquers two countries in two years and hints of more to come; China that says other countries must choose to either support it without question or be “with the terrorists;” and China’s new President who describes entire nations as “evil” and his country’s military operations in religious terms. I hate how the US is viewed by the world today. America is a truly great country, and doesn’t deserve to be considered deceitful, dangerous, arrogant, and greedy. But it is, because in the eyes of the world, George W. Bush is the US. It’s not as if we foreigners watch CNN. All we know about American politics is who’s President and how many bombs he’s dropping on other countries. Another day, another company tattooing itself onto people’s foreheads. This is why I love marketing: it’s not just shameless, it’s shameless and imitative. In 2003 it was Dunkin’ Donuts, now it’s Toyota taking the word “brand” too literally and slapping Scion logos and prices onto 40 human foreheads in Times Square. “This is the first time we’ve used foreheads,” says Toyota exec Brian Bolain, which is, just quietly, not a sentence you want to put into your press releases, Brian; not ever, not about anything. It sounds like there could be a second time; like forehead billboards could be the next big thing in advertising real estate. Presumably companies will pay varying rates for foreheads, based on available space (low hairlines equals low pay, people with fringes need not apply) and smoothness of texture (perhaps a deduction per zit). But wait! I’m forgetting the most important part: attractiveness. Because the point of forehead advertising is to embed the brand into the human host, so it becomes the most whole-hearted product endorsement ever. A person wearing a corporate tattoo says: I like this product so much, it’s literally oozing out of my skin! You don’t want uglies walking around embodying your product; if you’re buying human flesh by the inch, you want the good stuff. The nice-looking stuff. In the Ad Age report, Josh Tierney, one of the walking corporate billboards, says, “It is a little compromising.” Getting the tattoo, that is. The logo tattoo. Tattooed on his forehead. Josh strikes me as the kind of guy you want around when your plane crashes in the Andes and you need to pick someone to eat; he’d complain, but only a little. I have no doubt that this was pitched to Josh as a bit of fun: make some money, do something silly, why not? Don’t worry about concepts like dignity and individuality: you can have them back when you’re done. 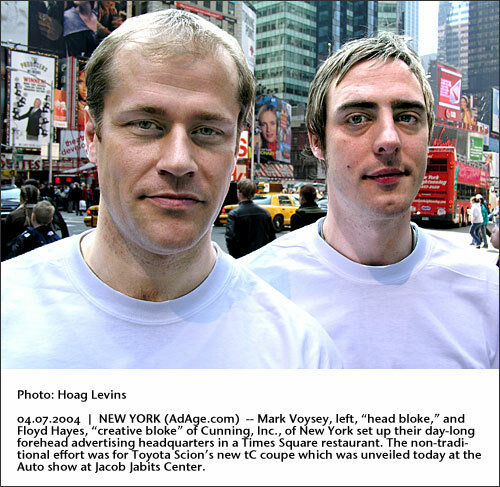 But look at the pic of the two marketing geniuses who convinced him, standing in Times Square as their forty Frankenstein Inc’s monsters roam around. Decent-looking guys. Nice, wide, smooth foreheads. But whaddya know? No tattoos.